Storing your boat in a safe area can relieve a lot of stress for most boat owners. Covered storage offers additional protection from the sun and ultra-violet rays which can deteriorate boat finishes and canvas tops plus attack seats, woodwork and carpet. In this Vermont section of the site, we list boat storage facilities by location relative to major cities, lakes and area attractions for your convenience. Some of the major cities we list, which are listed by region of the state, include St Albans, Vergennes, Burlington, Shelburne, Lyndonville, Montpelier, Waterbury, Barre, Morrisville, Newport, Fair Haven, Rutland, Bennington, Brandon, Randolph, Springfield, Wells, West Brattleboro, Wilmington and Hartford. 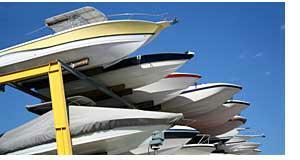 Many marinas offer boat storage and other services for launching and extracting your boat. Many of these marinas in Vermont also offer boat repair services. A partial listing of marinas in VT includes Malletts Bay Marina, North Hero Marina, Lake Carmi, Newport Marine Services, Lake Bomoseen Marina, West River Marina, Chittenden Reservoir Marina and Mountain Resort Marina. Boat storage options in Vermont are varied. Click here for boat storage options and step-by-step tips and instrictions. Boating insurance. Contact your Vermont boat insurance agent to make sure the policy is current and will cover the boat while it is in storage. For those who do not own a boat, and prefer to avoid the costs of ownership, rental boats can be a cost effective option. Locate boat storage facilities in other states. Consider weather and security implications when choosing local storage options. Extreme weather can damage fabrics and boat finishes over time. The need for security is a question one should consider as well. Covered and indoor boat storage is a good solution but may have height limitations which could eliminate some sailboats. Some Vermont indoor storage units may be too small for some pontoon boats, cruisers, cuddy cabin boats and other longer boats. Contact local storage facilities to confirm size limitations.